You must be a member of the Duesseldorf Reading Group to attend this activity. Would you like to join this group? NEW DATE due to several cancellations. Honeybees make decisions collectively - and democratically. Every year, faced with the life-or-death problem of choosing and traveling to a new home, honeybees stake everything on a process that includes collective fact-finding, vigorous debate, and consensus building. 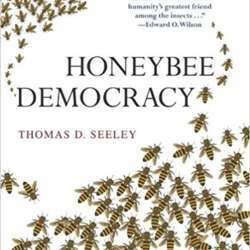 Animal behaviorist Thomas Seeley shares his impressive exploration of bee behavior. He shows in Honeybee Democracy that decision-making groups can be smarter than even the smartest individuals in them. He suggests that this may not only be the case for bees but also for humans. - When could a group you where in have profited from 'what the bees do’ in a conflict situation? - Can we really compare animals' instinctive behavior to human behavior? - What can we learn from the Greek philosophers, recent history and the bees for our own life - at work, at home, in our societies?